Zombies are a great scary Halloween costume and this zombie girls costume can be worn straight out of the package or accessorized with our large selection of zombie makeup, props, and accessories to make it unique to your child. This costume can also be used as a base for ghost, ghouls, and other spooky Halloween characters. 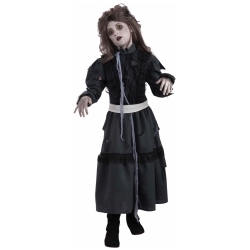 The Zombie Girl kids costume is colored as pictured. Costume includes tattered dress with gauze accents and belt. Available in child size medium or large.